It used to be that an AR-pattern rifle typically shipped with one of two types of stocks. You either had a bog-standard M4-style mil-spec adjustable stock, or a classic A2 stock as seen on the original AR-15 design. The M4 stock, still in service with our armed forces, has a small fanbase, but most servicemembers don’t care for it. When permitted, they change it out for something a little more ergonomic, often on their own dime. The A2 stock, while relatively comfortable, isn’t adjustable and doesn’t fit everyone. 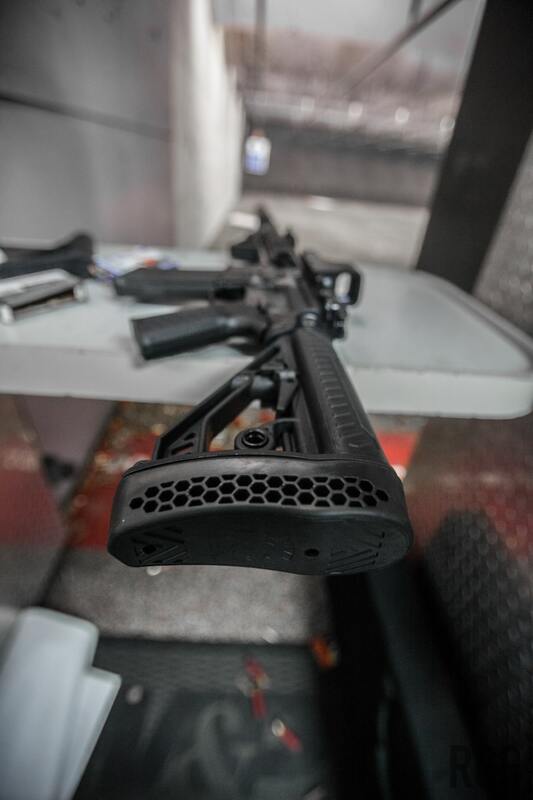 So, when the AR market began to resurge after the sunset of the AWB in 2004, companies maneuvered into position to produce newer, more comfortable offerings. In 2007, Magpul kicked down the door in earnest. Founded by veterans, the company knew what our fighting forces wanted, and also had their eye on the civilian market as well. 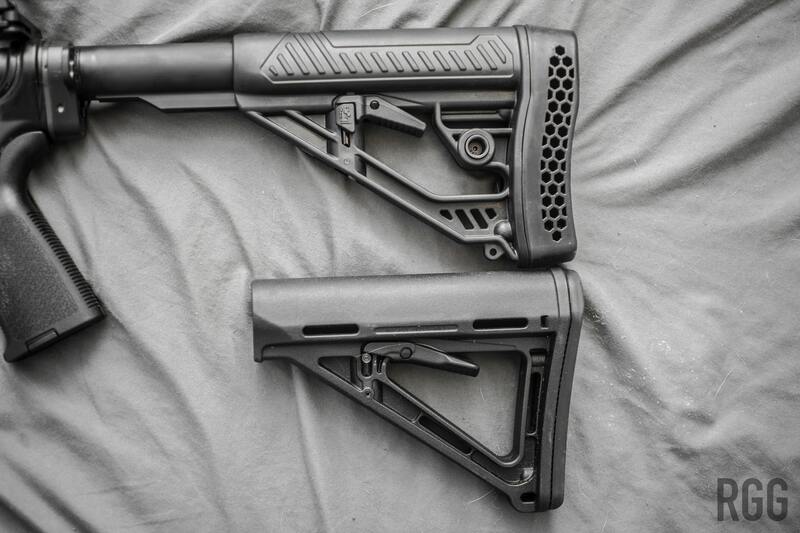 Producing a series of affordable and comfortable adjustable stocks for the AR platform, they quickly gained favor in the shooting world. Fast forward a few years, and most major firearms builders offered one of their stocks as a shipping option for their rifles. These days, at the bare minimum, a decently-built AR will ship with a Magpul MOE stock. It’s adjustable, and pretty ergonomic. My Colt LE6920 shipped with one. It does the job, and I got used to it. But one can always do better. Over the years, I was meaning to swap stocks at some point. Maybe another Magpul, maybe something by B5, I wasn’t sure, and it wasn’t really a priority. 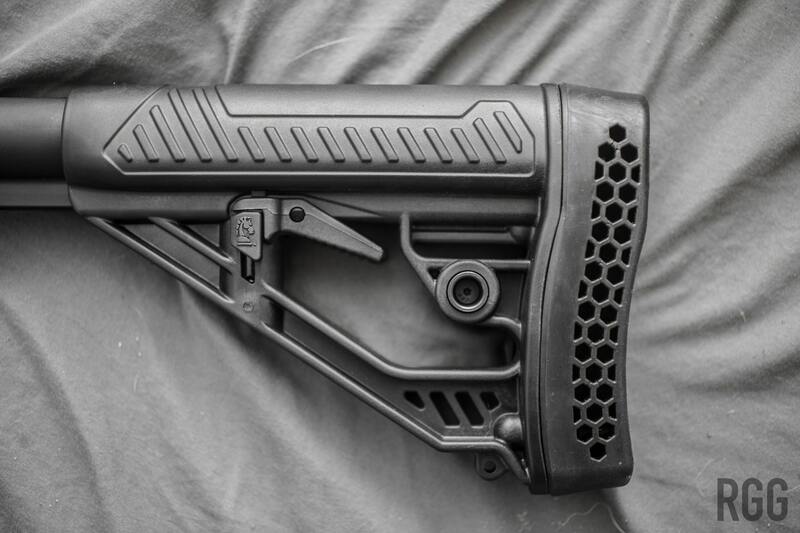 That changed though when I ran across rumblings of the EX Performance Adjustable Stock by Adaptive Tactical. With it’s prominent and very-squishy looking buttpad, it stood out. Being a smaller company, I figured they’d be a great target for a smaller blog to hit up for a test article. So, I sent off a request. A few days later, a gentleman named Gary responded in the affirmative, and sent out a test item to the RGG HQ. He who dares. I send out the requests, and sometimes people bite. Score. Anyways, about a week after the initial email exchange, the EX Performance stock arrived, ready for a quick evaluation. After unboxing the stock, the most noticeable feature, of course, was the sizable honeycombed rubber buttpad. In contrast to most stock designs, the buttpad is very generous. Made from a somewhat-grippy rubber compound, my initial shouldering tests at home demonstrated impressive ergonomics. The buttpad “squishes” into your shoulder, and the texture of the rubber means it will stay put, even when wearing a jacket or plate carrier, based on my informal personal testing wearing both. Now, please note, I’m not a battle-hardened veteran. I’m just the regular guy. Your mileage may vary with whatever your setup is. I kind of felt if I had an entire bed made of the rubbery material, I could sleep on it. It’s that flexible and squishy. Installation was a snap. 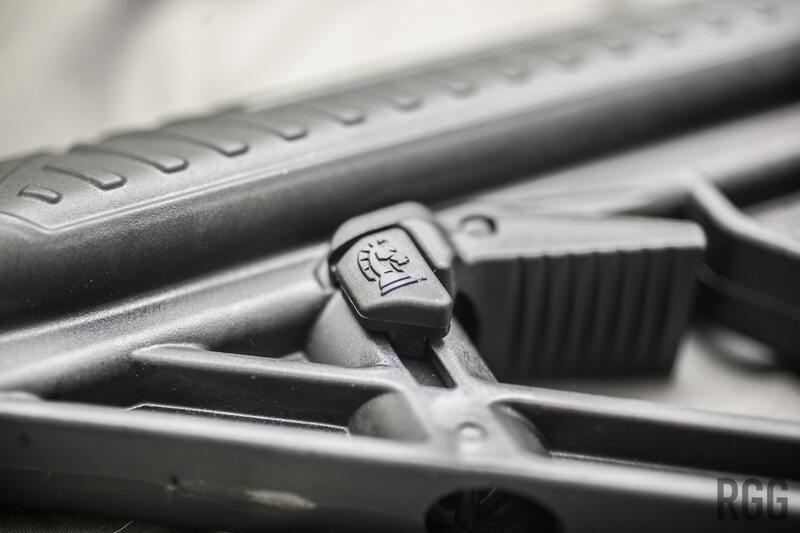 Most stocks have a small steel cross-pin to enable removal of a stock, but the Adaptive Tactical offering has oversized tabs (complete with “rook” logo) to pull down the pin, for quick installation and removal. The pin itself is oversized, as compared to other manufacturers’ stocks, in order to handle heavier recoil from calibers beyond 5.56mm. On the left side of the stock, is a steel quick-detach cup for a compatible rifle sling. You can pop it out and put on the right side of the stock if you are left-handed, even. 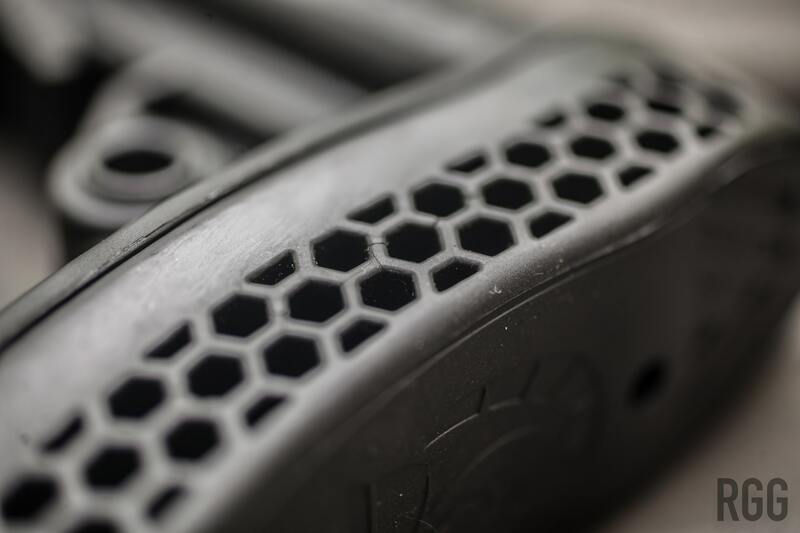 The cheek-weld zone is textured and has a generous angle (though not as much as a SOPMOD “special forces” style stock) and definitely guides you right in when shouldering your AR. Well, “Adtac” was nice enough to send me this stock for a real-world review, so I took it to the range. For this evaluation, I chose Florida Gun Center in nearby Hialeah (SFL people, shut up - if I open up a range it’ll be in Hialeah - cheap rents and ample warehouses…), just north of Miami proper. The staff there are quite accommodating and knowledgable, by the way. For the test, I started off with 30 rounds of Federal M193 55-grain 5.56mm ammo, while having my Magpul MOE stock mounted. No issues, nothing to write home about, done it a million times, and I’m slinging lead center-of-mass at 20+ yards. So, it’s time for the big test for the EX Performance stock. A quick swap and the EX Performance stock sat nicely on my Colt’s buffer tube. No problems there. Loaded up a mag with some more Federal, shouldered my LE6920, aimed COM, and fired 5 rounds downrange. Bang-bang-bang-bang-bang. Set rifle down, bought target back in. My rounds landed mostly COM in a fairly nice grouping. Typically if I rapid fire, I tend to drift a little upward after about the third shot. 5.56 recoil is negligible, but you will experience muzzle rise over the time of a string of fire. The EX Performance mitigates that, a lot. And compared to the Magpul, my comfort level was considerably higher. I’ll gush - I’m sold. Comfort is important. With that comfort comes better control, of course. If you feel comfortable with your firearm, you confidence level rises, and you aren’t overthinking things. Even that slight push of 5.56mm can throw someone off. I can also see the utility of the EX Performance stock on ARs of higher calibers, especially heavy hitting loads like the 458 SOCOM. Also, I’m willing to wager this could be a valuable tool to some of my friends out there who are fortunate to have select-fire AR-pattern rifles. Mag dumps in creature comfort. I can definitely recommend this for all AR shooters, especially beginners. The sight of that oversized buttpad goes a long way to assuage any fears of a “monster” recoil. It’s a whole lotta stock for the money. MSRP is $50, which is pricier than your factory/MOE stocks, but not by much, i.e. maybe $10 more, enough that it shouldn’t matter. 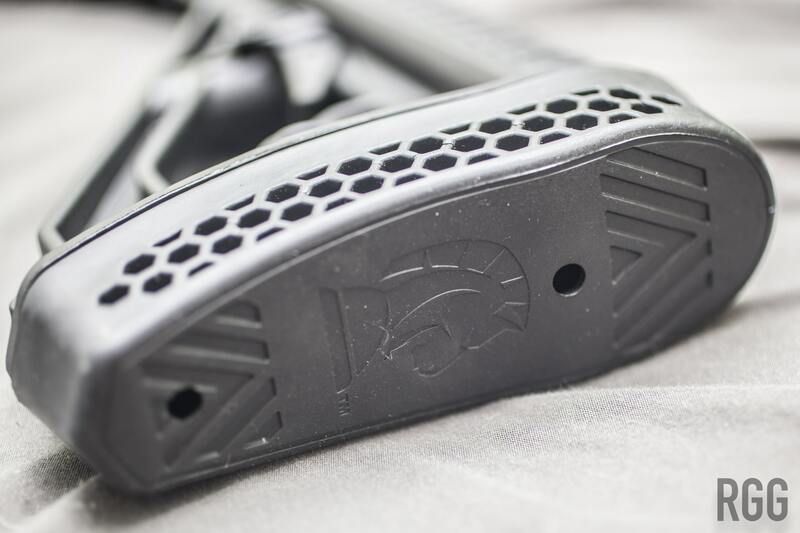 The EX Performance stock is a great investment for your AR, and you can’t beat the comfort. If it increases enjoyment of the shoot, I’m all about it. I spoke earlier of innovation, and while a stock may be considered pedestrian by some, this is definitely innovative. FYI, as of this writing, it’s also available in flat dark earth color, aka FDE.